Stock Market is on move we have seen good stock rally in last eight to nine months. It is expected that this strong market momentum will continue. 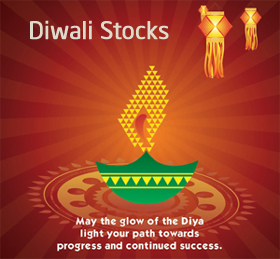 Its Diwali time and after going through Diwali stocks by ICICI it is time for Diwali stocks by Angle Broking. Axis bank is one of the largest private sector bank in India. Axis bank is positioned very well in terms of NPA. 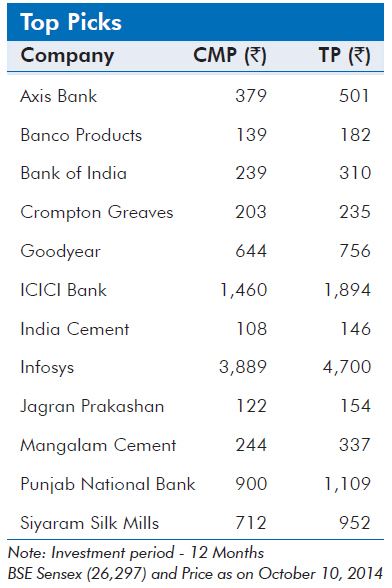 Net NPA ratio of axis bank is 0.44% as of 1QFY2015, which is one of the lowest in the industry. Axis bank is expected to grow further in future. Angle Broking recommend to buy axis bank with target of 501 Rs/-. Banco is a manufacturer of radiators and gaskets that have applications in automobiles, oil engines, compressors and locomotives. Banco is expected to give 15% CAGR in revenue over FY2014-15. Angle broking recommend to purchase Banco with target price of 182 Rs/-. PSU Banks such as Bank of India (BOI) are expected to be among the beneficiaries of an improved economic and policy environment. Going further BOI is expected to perform well in future. Angle Broking is advising to purchase BOI with target price of 310 Rs/-. Goodyear is market leader in tractor tyre segment. GIL is a debt free-cash rich company. It is expected that Goodyear will perform better in years to come. Angle Broking is setting target of 756 Rs/- for this stock. ICICI is one of the largest private sector bank. In past few months it is showing very good performance. With new investment and branch expansion ICICI is able to manage NPA very well. Angle Broking maintain our Buy recommendation on the stock with a target price of 1894 Rs/-. India Cements is the largest cement player in south India and the fifth largest player in India. New Smart city project and boost in Infrastructure development will surely help cement company and India Cement is one of them. Angle Broking Target for India Cement is 146 Rs/-. Infosys recently posted very good result and seen very good upside. Infosys further reinforced its USD revenue growth guidance of 7-9%. With growing dollar rate and future IT requirements Angle Broking recommend to buy Infosys for target of 4700 Rs/-. Download Full Report Market Strategy – Diwali Special by Angle Broking here. Hope this Diwali bring out the fireworks and join the markets in celebrating the good times that are now upon us! May Glow of Diya Light your path towards progress and continue success.